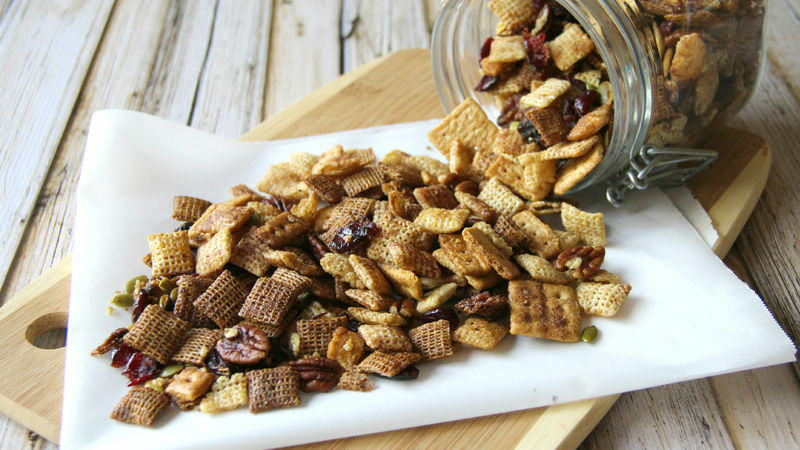 In oval 5- to 6-quart slow cooker, stir together the 3 cereals, pecans, graham crackers, dried cranberries and pumpkin seeds. In small bowl, mix together melted butter, brown sugar, pumpkin pie spice and vanilla. Stir until well combined. Pour over cereal mixture; stir until evenly coated. Cook uncovered on High heat setting 2 hours, stirring every 15 to 20 minutes. Spread cereal mixture on ungreased cookie sheet or waxed paper. Cool 3 to 5 minutes before serving. If you can't find mini graham crackers at your local store, simply use broken full-size crackers. Not a fan of nuts? Leave out the pecans, and substitute with pretzels.